The unrest in the Middle East has been going on for weeks now. First Tunisia saw a revolution that led to the leader of the state, President Zine El Abidine Ben Ali, being forced to flee the nation and relinquishing power. Then, in Egypt the citizens finally had enough of the rule of Mubarak and the unfair way the political system was run. Tired of the corruption and increasing cost of living, Egypt also revolted and caused a political reform. Now it seems like various nations in the Middle East and Northern Africa are following suit. It appears that the people have realized that they do not need to stand the oppression that they have faced, but instead they can stand up to it and bring about the necessary reforms. One of the states where a revolution is breaking out is Libya. In Libya, there is a clear call for political reform that would modernize the state with democracy. In the traditionally Islamic state that is officially named the Great Socialist People’s Libyan Arab Jamahiriya, it is feared that if reform is not brought, a civil war may break out that would lead to numerous citizens losing their homes and possibly their lives. The leader’s son also admitted that much of the violence was caused by the military and the police reacting too harshly. As of press time, the report of casualties during the protests that saw a military camp get attacked sits at 219 dead. To get official tallies from Libya is difficult due to the state being very controlling on sharing information with other states. One bit of information that has been made available is that Saif Gadhafi believes that some of the things needed to be done to improve the situation in the state include increasing salaries, getting rid of the older laws that force unnecessary restrictions, and creating a constitution. 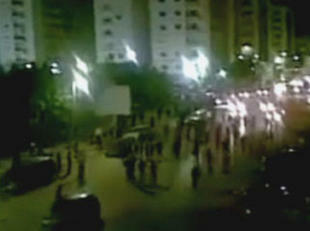 So far, there has been unrest in Libya for nearly seven days. With no ease in the tension in sight, it is time for the government to either step up or step aside so a new government can rise like it has in Egypt. Otherwise, a civil war is not just a very realistic possibly, but a likelihood.